We have covered both Sonarworks with their software only solutions and Trinnov Audio with their high end dedicated high end room correction solution, but what if there was a middle ground? Well maybe there is, thanks to a community member's question. We have come across the Dirac Live software room correction software and then were led to a hardware solution from miniDSP that has the Dirac Live system built in. So Mike Thornton decided to take a look and see what it could offer. 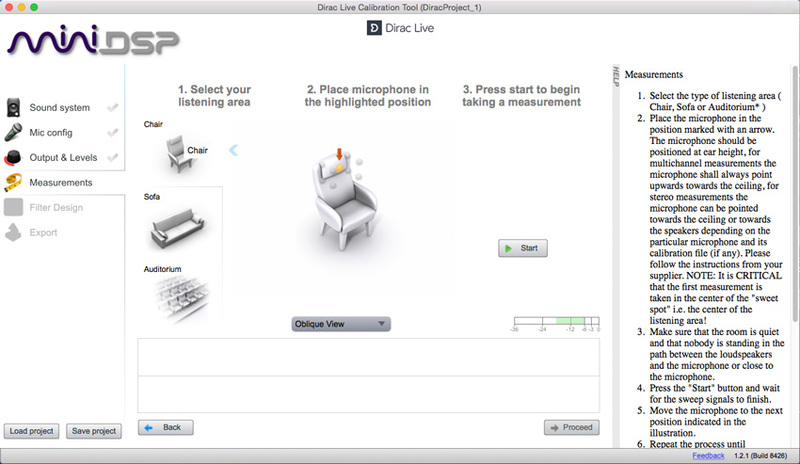 Community member Jenny Ng got in touch to ask if we had heard of the Dirac Live room correction system. 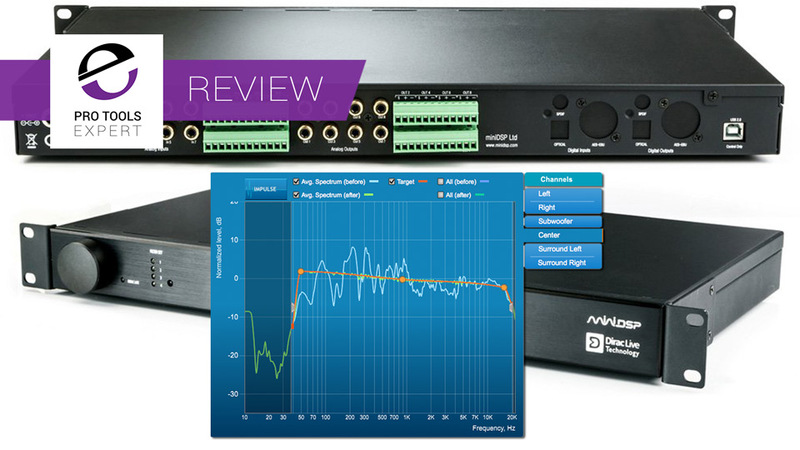 We hadn't, so we reached out to Dirac Live and they responded, and when we explained what we were looking for, they recommended the miniDSP DRM-88A solution as it is a hardware unit that would sit between the interface and the monitors. They asked miniDSP if they would send us a unit to try out and they very kindly sent one from their HQ in Hong Kong. What Is the miniDSP DDRC-88A? The DDRC-88A is the big brother of the stereo DDRC platform introduced by miniDSP in 2014. The DDRC-88A uses their 8x8 DSP board and miniSHARC module to create a cost effective 1U processor. There is an infrared remote learning feature and the front panel rotary encoder allows for control of the DDRC-88A processor without any need for a connected computer, once the processor is configured and filters loaded. The DDRC-88A is an upgradable platform thanks to the DDRC-88BM software, which miniDSP refer to as a 'plugin', but this is not an AAX, AU or VST plugin but essentially an application that controls the unit during the setup process. As with any room correction system, Dirac Live is designed to correct the system’s frequency response. 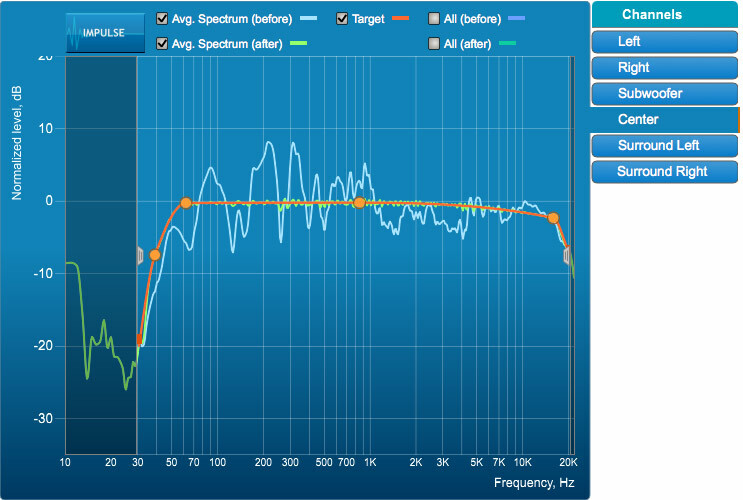 In contrast to some systems, Dirac Live corrects the frequency response towards a user-adjustable target response. The target response takes account of the natural frequency range of the loudspeaker system and the normal effects of loudspeaker dispersion on the measured in-room magnitude response. This different workflow takes some getting used to but once you do it makes all the difference. In addition, Dirac Live corrects the system’s impulse response, which reflects how the system responds to sharp transients such as a drumbeat. Reflections, diffraction, resonances, misaligned drivers, and so on, all combine to smear out the transient. An ideal loudspeaker would have none of these, so correcting the impulse response makes the real speaker in the room behave much more like that ideal loudspeaker. The impulse response is a critical factor for accurate imaging, clarity and bass reproduction. 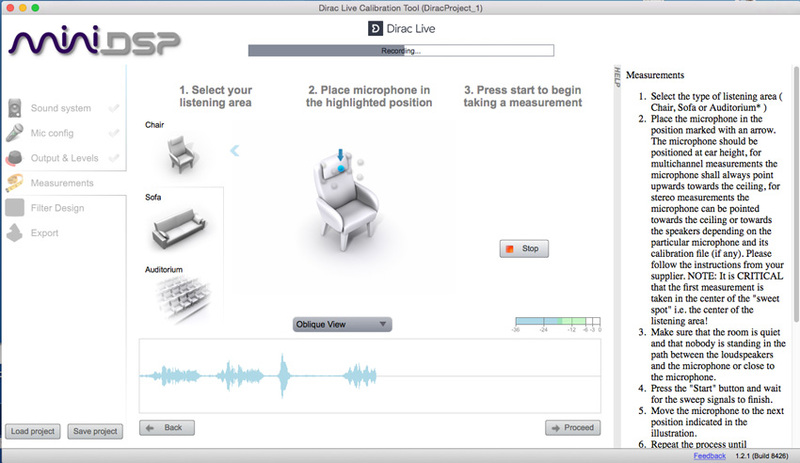 Dirac Live uses an analysis algorithm designed to create the optimal correction across the whole listening area, not just at a single point. Dirac Live accomplishes this using mixed-phase filters – filters that match a desired frequency response and generate a customised impulse response. While minimum-phase and linear-phase filters are relatively easy to design, they are tightly constrained in their impulse response characteristics – neither can make a desired change to the magnitude response independently of controlling the impulse response. In some cases, they may even make things worse. Mixed-phase filters are more difficult to design, but the audible performance of Dirac Live is due to its success in using mixed-phase filters to make the system response across the whole listening area more closely resemble that of an ideal speaker. The energy from the direct wave and from early reflections is optimally combined to arrive as a single wavefront to the listener. Late reflections are left largely untouched, being corrected only for their spectral coloration, as they contribute to a larger, more enveloping soundstage. The software plug-in extends the capabilities of the DDRC-88A multichannel Dirac Live processor and adds bass management and crossover capabilities. The input signals can be low-pass filtered and summed to generate the subwoofer signal for bass management; a matrix mixer routes or mixes these channels for the Dirac Live algorithm, which in turn has its outputs routed or mixed to the output channels, where additional high/low pass and parametric filtering takes place. In addition to improved bass management, the DDRC-88BM allows for solutions like multi-subwoofer control and combined DRC/active loudspeaker setups. So if you have a monitoring system that requires bass management then you can handle this as well all in the hardware unit and away from your DAW. As I have a monitoring system now that doesn't need bass management, we won't be focussing on this feature in this review but if you need it then it is available as an optional extra. The price for the DDRC-88A is $999 and that includes the Dirac Live software as well as the measurement mic and the software. You can have the bass management option is an extra $99 if you need bass management. My monitoring system is built round my monitor controller also being one of my Pro Tools interfaces, in my case an Avid HD Omni. I use the HD Omni in monitor mode and so I use the D-Sub balanced outputs to feed my 5.1 system. I have 3 PMC LB1 speakers across the front for my Front Left, Centre and Front Right speakers, all fed from Bryston PowerPro 60 amp blocks mounted on the back of the LB1s. For my surround speakers, I am using a pair of PMC TB1s so my suurounds have a similar colour and tone as my front speakers. Unfortunately they didn't come with amps so I am using a Samson Servo 200 stereo amp to drive them. I have a D-sub to XLR loom and then XLR cable to the 3 Bryston amps and the Samson amp. 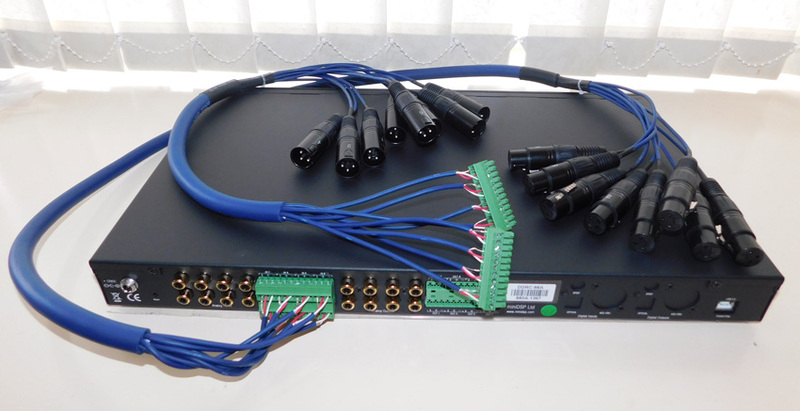 As the miniDSP DDRC-88A has balanced inputs and outputs, I simply bought a 3m 8 way XLR loom and cut it in half and wired up the phoenix terminal blocks on the back of the miniDSP unit. Then it was just a matter of replugging the XLRs to insert the miniDSP unit between my HD Omni and my monitors. There happens to be a convenient space in my rack just above the HD Omni right in front of me to fit the miniDSP 1U unit. Now I have the unit installed in the signal path it is time to setup and calibrate the system. There are two applications that need to installed on a computer. The installers come with Windows and Mac versions and the manual walks you through how to install and use both of them. The Dirac Live Calibration Tool is the app you use to setup, measure and calibrate your system and the DDRC_88_BM is the 'plugin' app that you can use to control the miniDSP unit, if required. Using the Dirac Live Calibration Tool is a matter of working through the set up stages, which the app walks you through. First telling it I have a 5.1 system but it supports stereo and 7.1 as well. Clicking Proceed takes you to the next stage. Next it's the Mic Config tab, and loading the mic calibration file. The system comes with a USB measurement mic and they calibrate each one, so you go to a web site, enter your mic's serial number and download two calibration files. One end fire and the other calibrated for 90 degs. They recommend using the 90 deg calibration files especially for multi-channel systems so you don't need to point the mic at the different speakers. Then comes Outputs and Levels. Here is where you can allocate the channels. The default setting has the subwoofer channel on channel 3 but as I am using the ITU configuration on my HD Omni, I needed to swap channels 3 and 4 so channel 3 was the centre and channel 4 the sub. Then it is setting the levels. Against each channel is a Test button, Clicking on the Play button plays pink noise through that output. Then it is a matter of adjusting the Output volume slider so that the level displays in the middle of the green zone on the channel meter. I then repeated for each of the channels adjusting the amp gains on the surround and sub to get them all at the same level. Now we get to the fun bit - the Measurements tab. Choose the type of seating arrangement to match what you have. I chose Chair as it is usually just me sat in the hot seat, but you can choose Sofa, which might be useful for the client sofa or if there are two of you sat at the mix position, finally there is auditorium if you need the sweet spot to cover a larger area. You then get a graphic and the software demonstrates where to place the mic for the first measurement. I learnt that it is worth checking at least two of the views to make sure you have the mic in the correct position especially the height, as it isn't clear from the top view where the mic should go. Once the mic is in the correct position then clicking on the Start button initiates a sweep tone test sequence from each speaker. I strongly recommend that you leave the chair in place when you do the tests, not so much for the acoustic properties of the chair but to provide a reference guide when positioning the mic in the various locations. 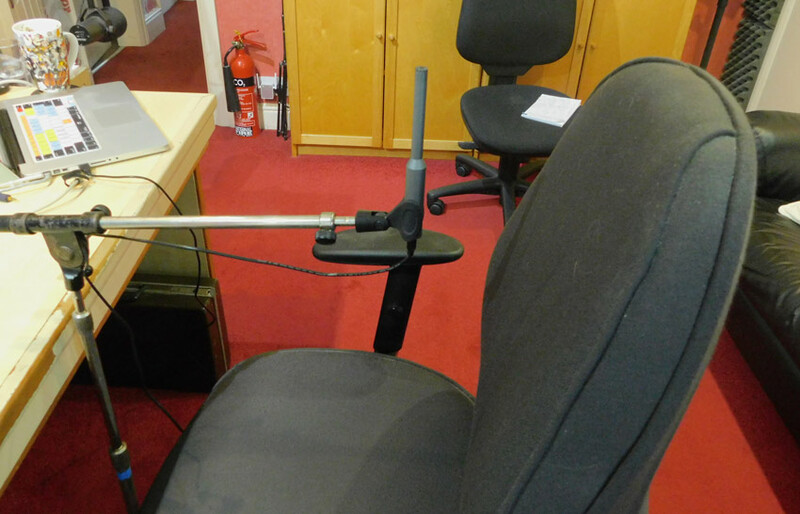 Once I realised that I couldn't position the mic accurately I redid the measurement cycle with the chair in position. Once all the measurements are captured from the different locations around the listening space the Calibration Tool calculates filters to provide the correction. The Calibration Tool offers a 'starter for ten' (Auto Target) as a suggested target curve (the red line in the graphs below), but the manufacturers recommend that you study it in conjunction with the natural response of your speakers, especially when looking at the roll off at top and bottom ends. Speakers have a natural response. You can use the Dirac Live system to tweak it but remember you can't work miracles as you are usually constrained by the laws of physics. I am fortunate in that my speakers already have a very good natural response, its one of the reasons I chose them. If you look at the natural response of my speakers especially the surrounds (shown by the blue lines) and you will see that they roll off below 100Hz, Compare that with the Target (the red line) and see how the red line will give me a boost at the low end, which I can hear in listening tests. 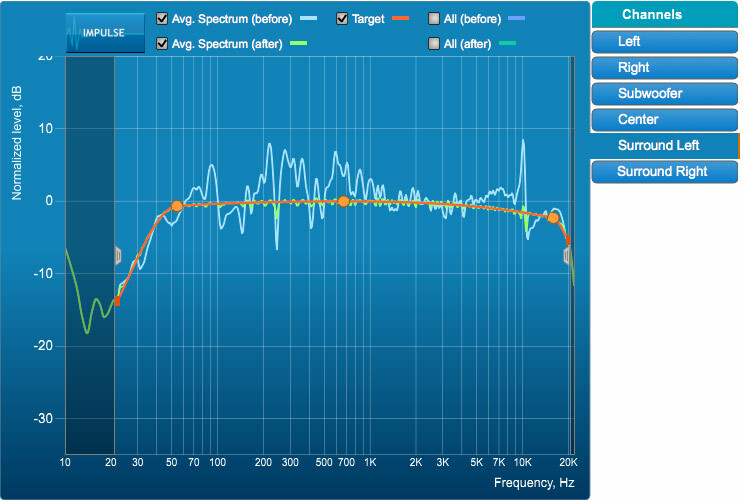 Now I could start some detailed listening knowing that I had optimised the system properly for my speakers and room. I have had the unit in my studio for a couple of weeks now as I wanted time to get to grips with it and spend serious time listening through it. I have to be honest by saying that I wasn't convinced from my earlier listening tests, it would be fair to say it was different, rather than better, and I couldn't be sure that with the Dirac Live enabled it was better, just different, I couldn't determine which was better, just that they were different. Sometime the image width changed with the correction enabled, with the stereo image wider on some content, and then for other content narrower. The change in bass response was off putting as well and so with the initial tests being inconclusive, and not being sure which was right, with or without correction. As a result of the inconsistencies, I wanted to be sure about my test conditions, and so after more research and talking to the very helpful tech support team at miniDSP, I went back into my 'With Chair' measurements and reworked the Target Response, working with the speaker responses and unlinking the speakers and then having loaded up that revised profile into one of four slots on the miniDSP, undertook more detailed listening. Almost immediately things were different, the bass response issues were gone, as were the variations in stereo image width across different tracks and from within a track. Now I would be lying to say that the changes with this latest correction profile enabled were spectacular, they weren't, but remember I have excellent speakers and a good room as a starting point. The difference now is that the changes, albeit subtle, were there and they were consistent, and that was the clinch for me. The inconsistency of the earlier listening tests concerned me. Things have to be repeatable and consistent, or you have no way to be show that what you have changed is the reason for the improvement. So what was it that has changed? As I said it is subtle, but I can best describe it as the lack of smearing once the correction is enabled, I can hear through the mix, it's not brighter or warmer, it is clearer, it is like the lens has been focused so the edges are no longer soft, they are in focus. Moving on to surround content and the sense of the veil being lifted was even clearer, the surround image was more precise and on reflection after my extensive listening tests I believe the fact that Dirac Live compensates for both frequency response and impulse response may be the key. In my latest listening tests everything seems tighter as though the transients are coming through without having the edges softened.